Acronis is leading the next wave of data availability, accessibility and protection solutions to simplify today’s complex IT environments. Acronis technology enables organizations of all sizes to manage the always-on anywhere data access demands of users, reducing risk against the loss of valuable corporate data, and controlling management and storage costs. With proven technology for data migration and disaster recovery for physical, virtual and cloud environments, and secure enterprise file-sharing and synchronization regardless of type or platform, Acronis is enabling organizations to embrace new IT strategies and options such as BYOD and Mac in the enterprise. Data is growing, technologies are becoming more complex, and budgets are shrinking. 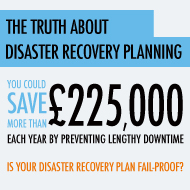 With Acronis, you do not have to sacrifice disaster preparedness. By consolidating your IT infrastructure, you can increase system utilization, as well as the efficiency of your resources. Reduce TCO, improve profitability and prevent downtime. Few businesses today can survive major data loss without a comprehensive backup and DR strategy in place. Yet most businesses face a common challenge – their business data is growing at an insane pace while their IT budgets are, in real terms, flat-lining. This is According to the Acronis Global Disaster Recovery index 2012, which is the industry’s largest Annual Worldwide Ranking of International Confidence in Backup, and Disaster Recovery (DR) Readiness, Capabilities and Practices - In conjunction with the Ponemon Institute with more than 6,000 respondents in 18 countries worldwide. Business leaders and senior executives around the world have been given a wake-up call to reassess backup and disaster recovery (DR). They must plan for the worst and ensure they have the tools, and the means, to endure the unexpected. If data is the lifeblood of your business, Acronis offers businesses effective IT disaster recovery for better data protection.